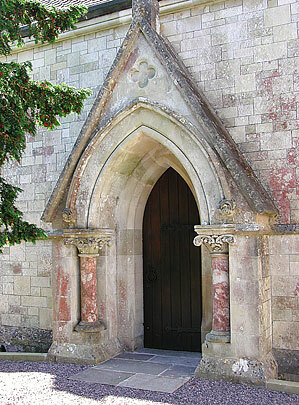 Gateway of Fonthill Abbey. 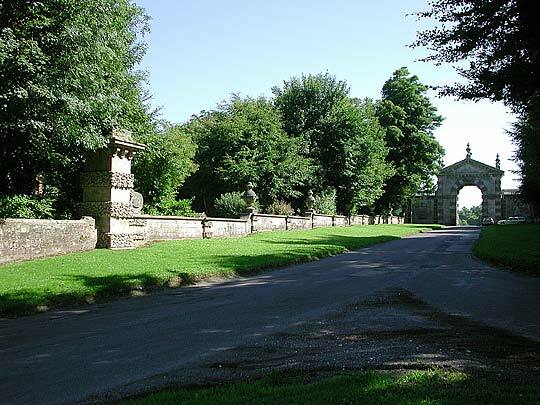 Architecturally the most important of the remains of Fonthill is .. the gateway from Bishop's Fonthill. It is on a monumental scale, tripartite, with a big arch in the centre and lower balustraded one-bay side-pieces. The centre has a heavy pediment. The angle pilasters supporting have intermittent rocky rustication. The same motif round the arch. The head in the keystone hardly visible in its rocky surface. To the outside the gateway is continued by retaining walls with vases. They end in big piers. Now all this is attributed by Rutter in 1823 to Inigo Jones on the strength of local tradition (mid-1600s). ... The style of the gateway makes Jones's authorship quite acceptable. Some recent authorities, e.g. 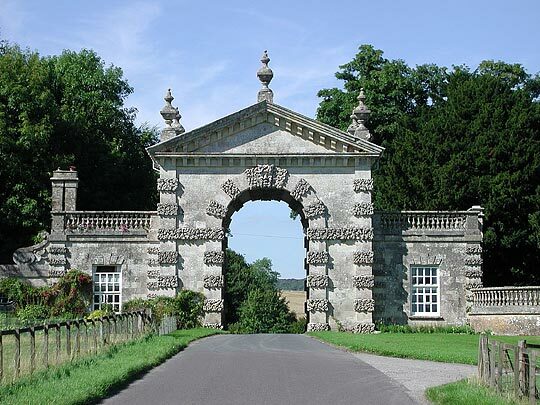 Mr John Harris, consider however that the gateway dates from the time of Alderman Beckford (mid-1700s. 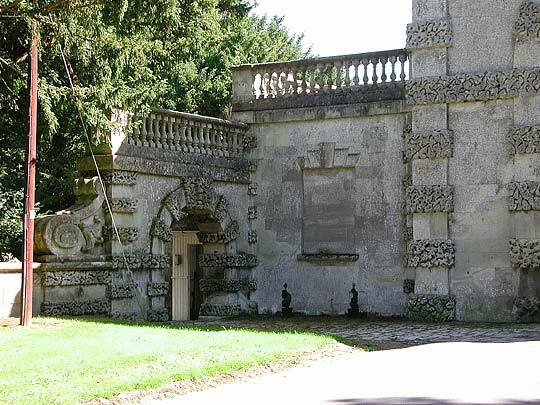 He was father of William Beckford who built the famous Gothic Fonthill Abbey early in the next century and of which little remains). 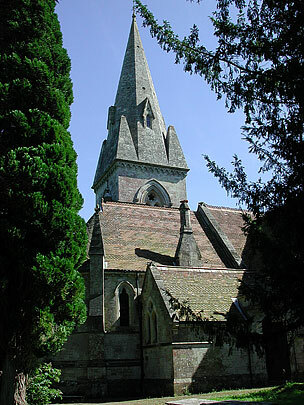 Holy Trinity, Fonthill Gifford. 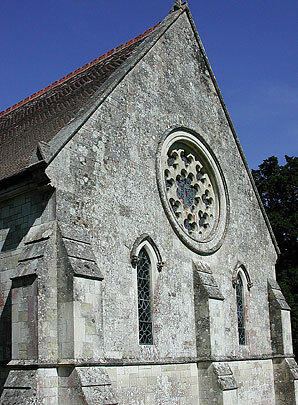 (The church faces north-east rather than east). Built for the Marquess of Westminster in 1866 by T.H. 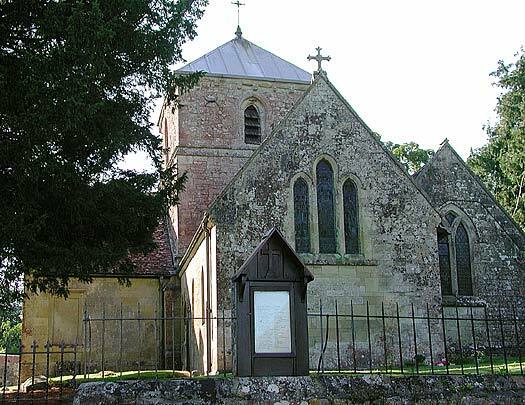 Wyatt, alas to replace a pretty classical church of 1748, built for Alderman Beckford. 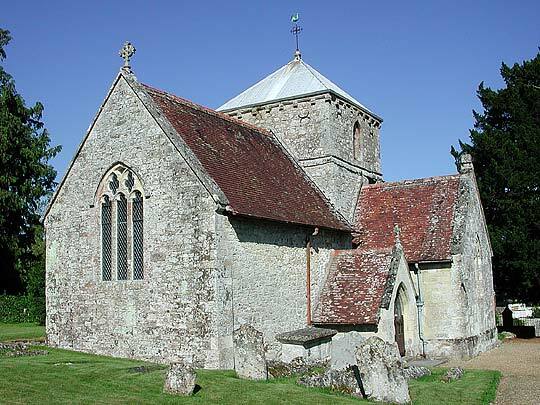 ... Wyatt's church is bigger of course and, it must be admitted, groups extremely picturesquely from the E with its NE tower with a spire rising between pyramid pinnacles, an apse, and a round turret to its N (not shown). The tower serves as a porch and has short alabaster columns. 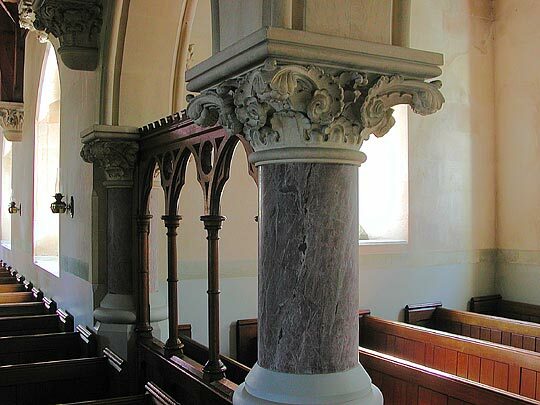 Inside two-bay transepts, again short, fat piers, and much rich foliage carving by Mr. Sansom. 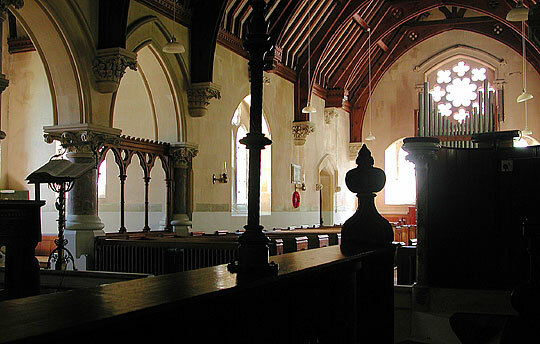 The chancel and arch are low and rib-vaulted. 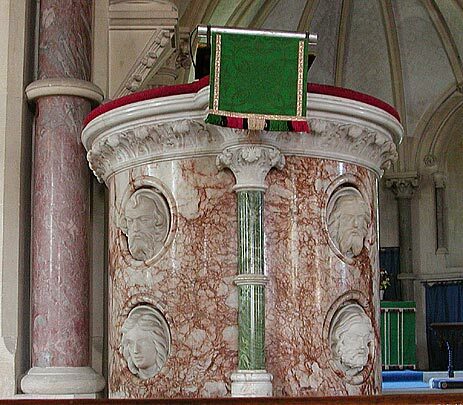 Alabaster pulpit (with carved medallions of the heads of the four evangelists). 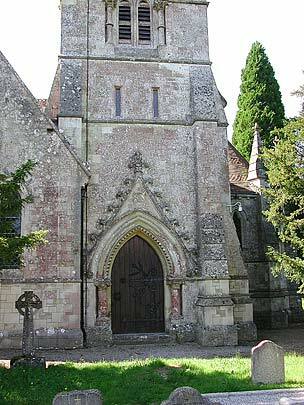 All Saints, Fonthill Bishop. A complete little E.E. 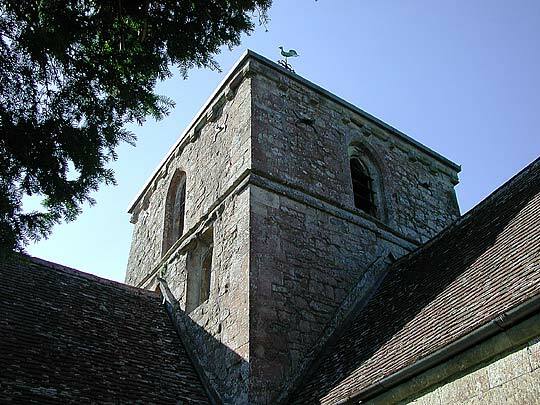 church (Early English, 13th century) with a crossing tower, though over-restored (T.H. 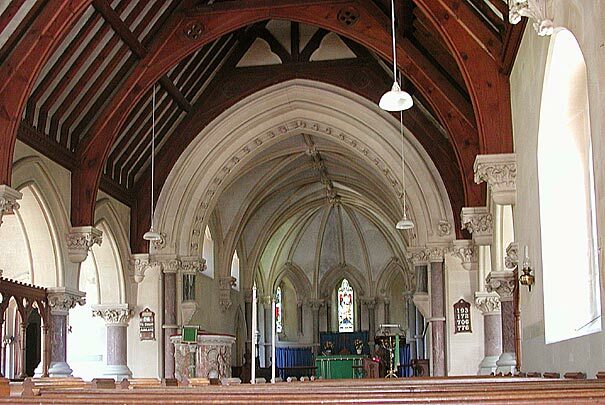 Wyatt, 1879) and with a rebuilt chancel. The tower .. has single-light chamfered bell-openings.